Dry to moderate moisture. Prairies, meadows. Full sun. 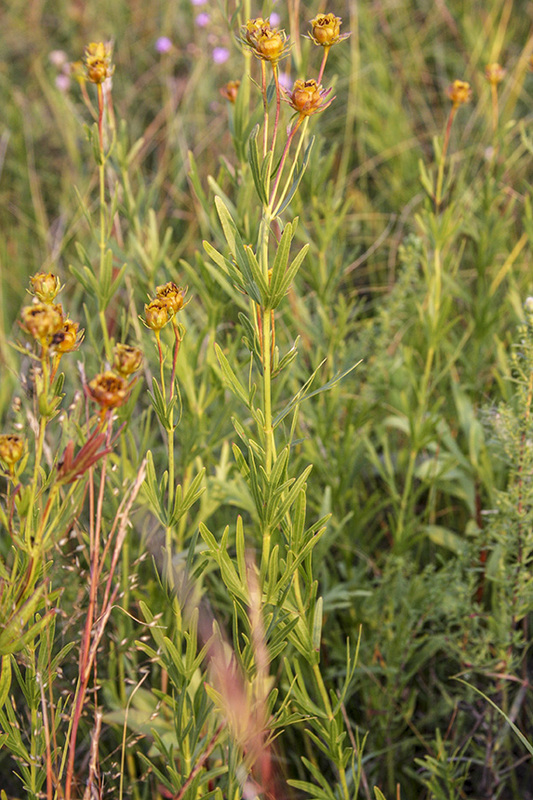 This is a 12″ to 48″ tall, erect, perennial forb that rises on usually one or more stems from a long, creeping rhizome. It sometimes forms dense colonies. 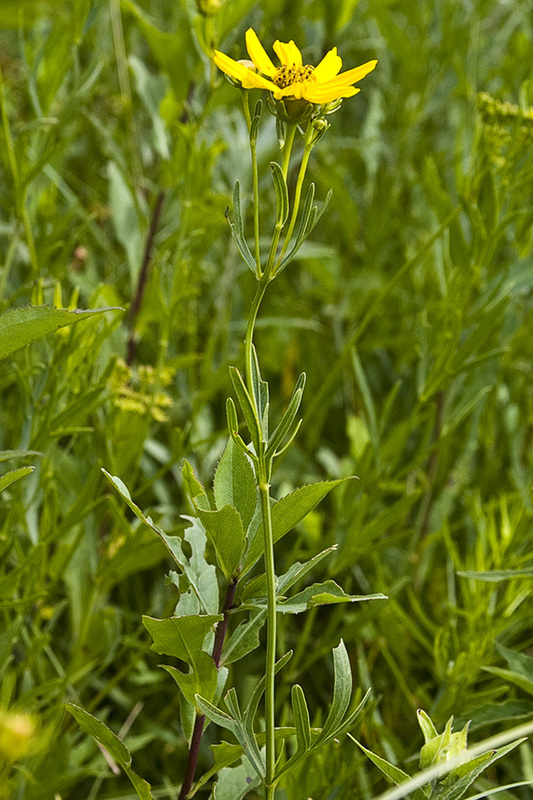 The stems are erect, unbranched, and mostly hairless or sparsely hairy at the base of the leaves. They are green with light green vertical stripes. The leaves are opposite, broadly inversely egg-shaped in outline, 1⅛″ to 3⅛″ long, and stalkless or almost stalkless. They are distributed in 6 to 12 pairs along ⅔ or more of the stem. They are usually hairless but sometimes have a few hairs on the margin near the base. The leaf blades are usually divided into 3 lobes well above the base and have the shape of a turkey foot. The lobes are sometimes lobed again, resulting in 3 to 7 (rarely to 9) ultimate lobes. The lobes are narrowly oblong, ⅝″ to 1½″ long, and 1 ⁄16″ to usually ⅛″, sometimes ¼″, wide. 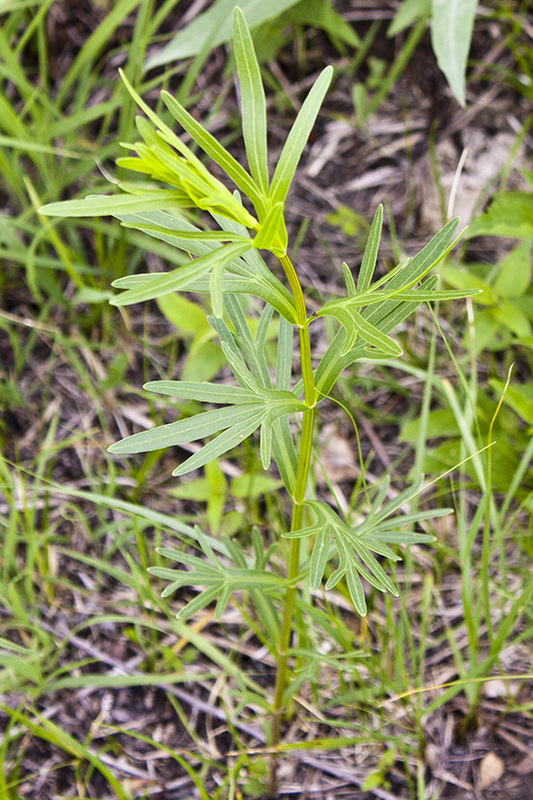 Upper leaves are sometimes unlobed. The inflorescence is one to a few flower heads at the end of the stem and from upper leaf axils. 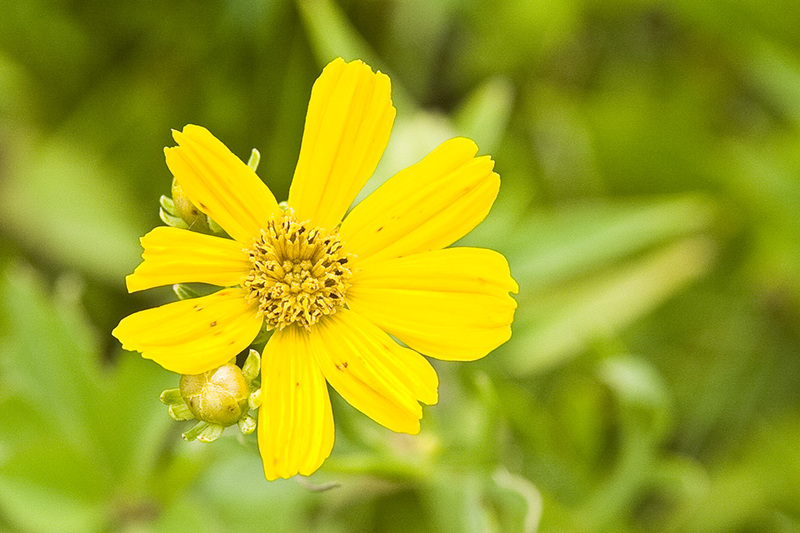 The flower heads are 1½″ to 2½″ wide on stalks ⅜″ to 2″ long. 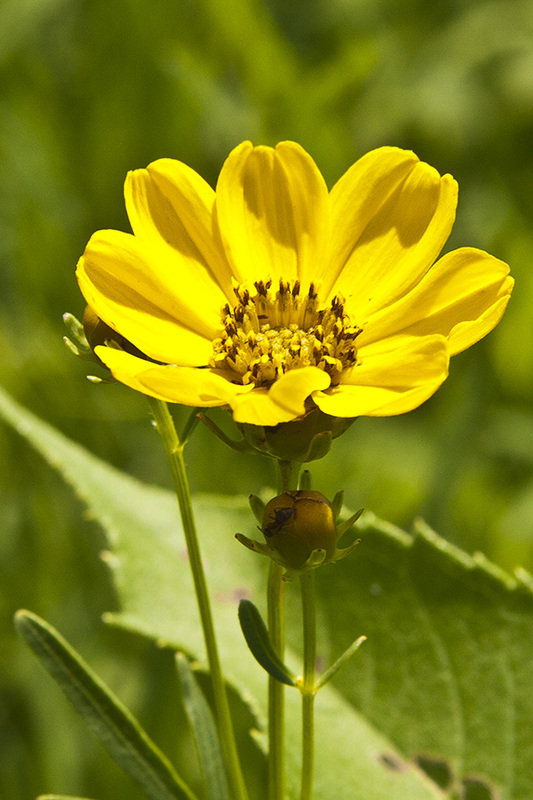 The involucre is bell-shaped and is composed of 2 series of bracts, 8 inner bracts and 9 to 12 or more outer bractlets. 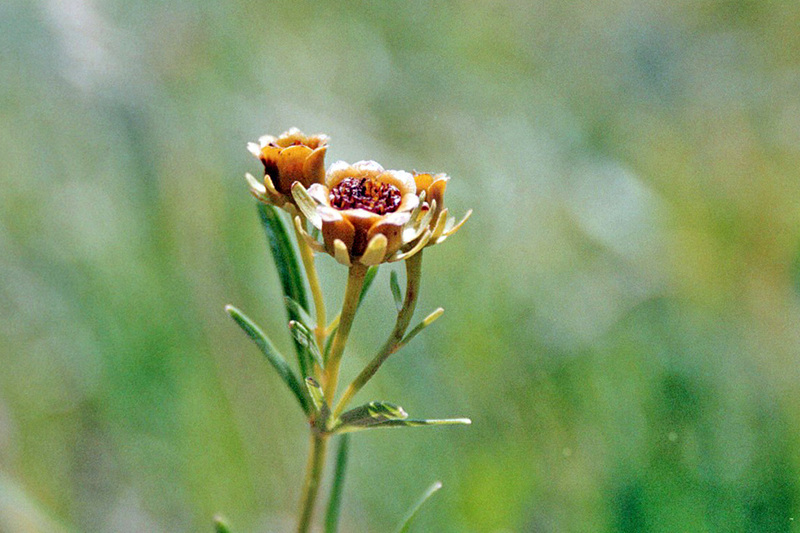 The inner bracts are yellow-brown, oblong to nearly circular, ¼″ to ⅜″ long, ⅛″ to 3 ⁄16″ wide, and bent backward above the middle. 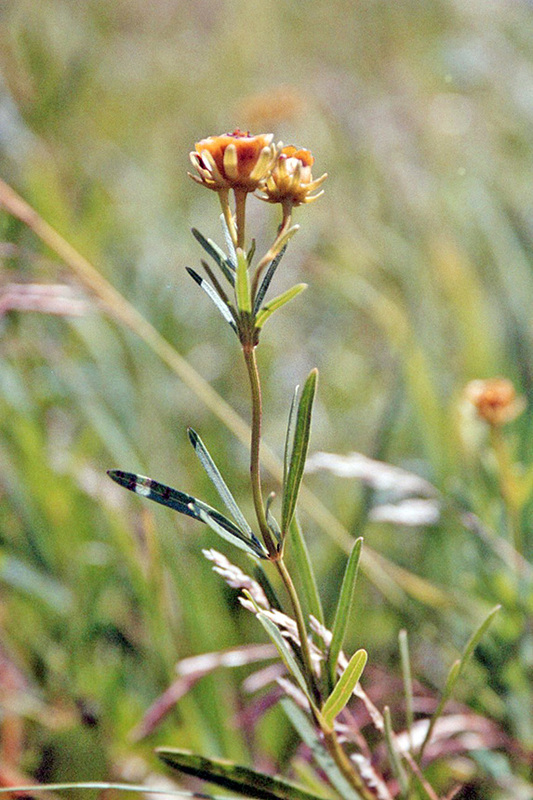 The outer bracts are green, linear, ascending, and about ¼″ long and ⅛″. There are 8 to 10 ray florets and 60 to 80 disk florets. 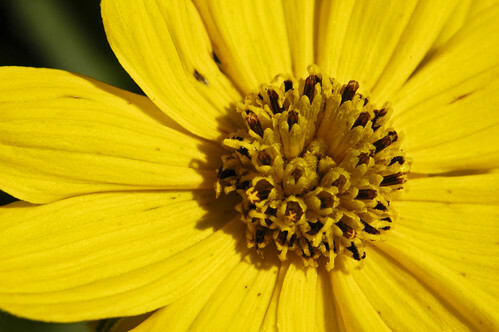 The ray florets are yellow, ⅝″ to 1″ long, and about ⅜″ wide. They are more or less rounded at the tip and may have 2 or 3 (sometimes 4) tiny teeth at the tip. The disk is ⅓″ to ½″ wide. 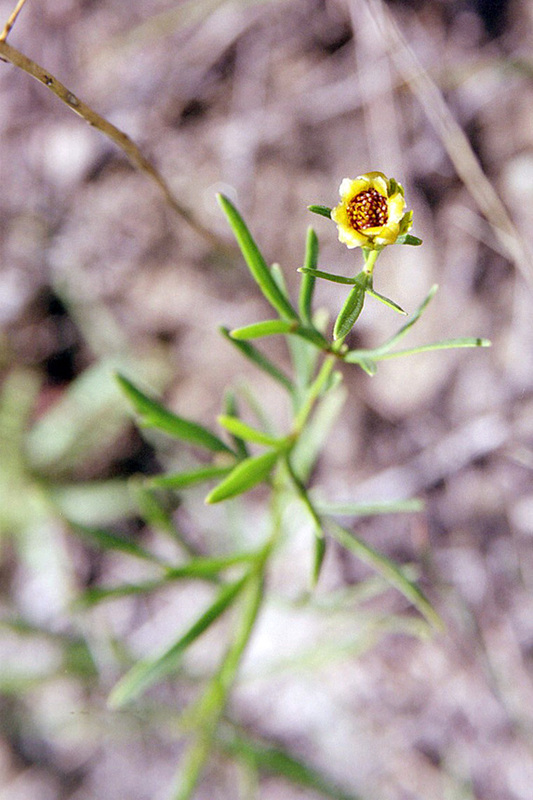 The disk floret is a yellow, 5-lobed corolla tube with a branched style. There is no floral scent. The fruit is an achene that does not have a tuft of hair (pappus) attached. 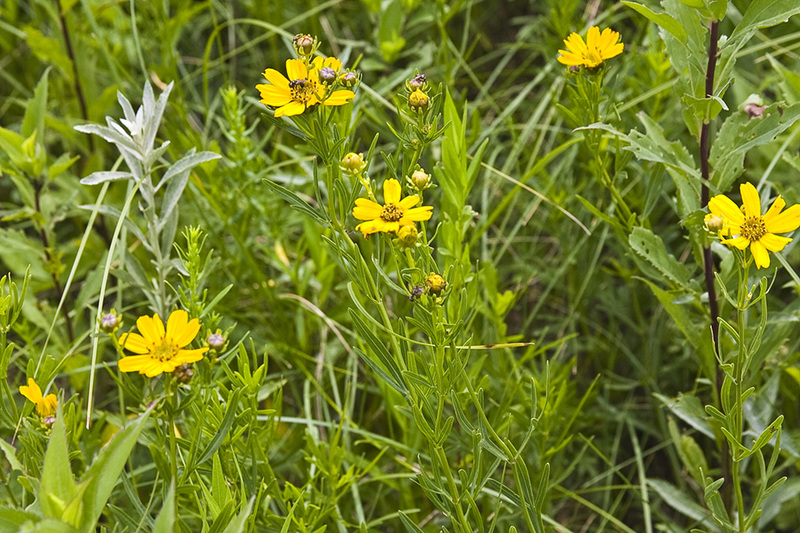 Plains coreopsis (Coreopsis tinctoria var. tinctoria) is much branched above the middle. 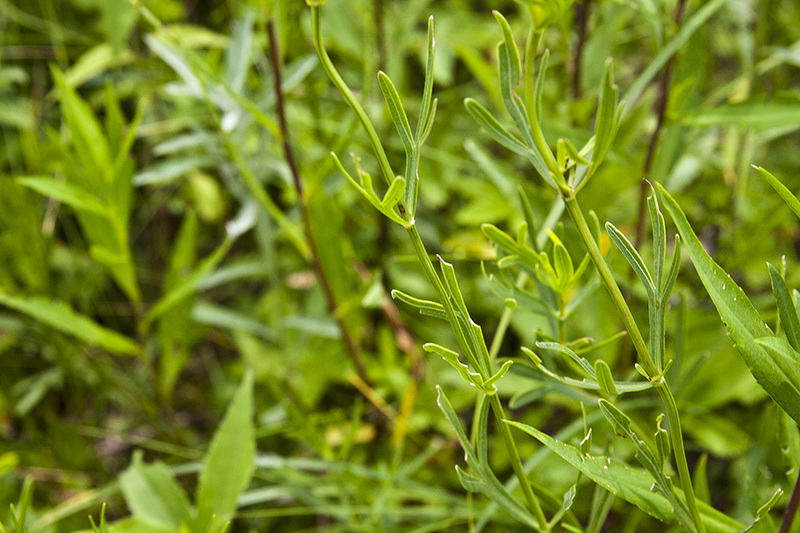 The leaves are pinnate, bipinnate, or 3 times pinnately compound. The inner bracts on the involucre are reddish. 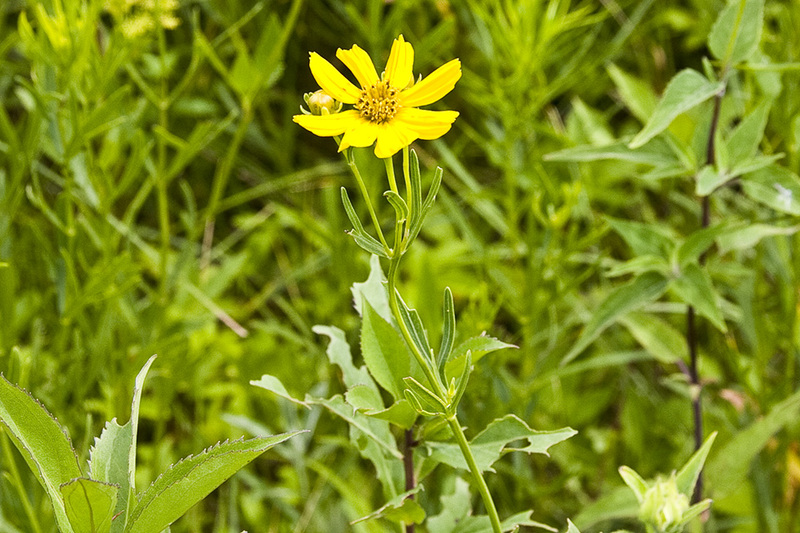 The ray flowers have a red-brown blotch at the center and are divided at the tip into 3 lobes. The disk flowers have a dark tip causing the disk to appear dark.